Professor at Moscow Tchaikovsky Conservatory, the Queen Sofia Superior School of Music in Madrid, and International Piano Foundation at Lake Como, Italy. Among today’s foremost pianists and pedagogues. Winner of Marguerite Long competition in Paris, he has performed with Chicago Symphony, Cleveland Orchestra, Royal Philharmonic, l’Orchestre de Paris, Israel Philharmonic, St. Petersburg Philharmonic, Gewandhaus Orchestra, Vienna Symphony, among many others. Has given master classes the world over: at Salzburg Mozarteum, Gilmore and Verbier festivals, Paris Conservatory, Sibelius Academy, Mannes College. Adjudicated such competitions as the Richter in Moscow, Horowitz in Kiev, Rubinstein in Tel Aviv, Santander, Leeds, Minneapolis. Professor of Piano, Buchmann-Mehta School of Music, Tel-Aviv University; Barenboim-Said Academy, Berlin. Born in Lithuania; studied with Mindru Katz, Ilona Kabos, Guido Agosti, Aube Tzerko, and Ania Dorfmann. Doctor of Musical Arts degree, Juilliard School. Soloist with Israel Philharmonic under Leonard Bernstein, Carlo Rizzi, Sidney Harth and others, as well as with other Israel’s orchestras. Recitals in USA, Europe, and Israel. Recorded on CD late piano sonatas by Schubert. Collaborated in concert with Isaac Stern, Natalia Gutman, Ileana Cotrubas, Vera Vaidman, among others. Taught master-classes at Juilliard, New York International Keyobard Festival, Paris Conservatory, London Royal Academy of Music, Royal College, and Guildhall School, Queen Sofia School in Madrid, Berlin Universität der Künste, Moscow Tchaikovsky Conservatory, among many others. Jury member at international competitions: Arthur Rubinstein, Leeds, Dublin, Iturbi (Valencia), Honens, Horowitz (Kiev), Maj Lind (Helsinki), Konzerteum (Greece), Tbilisi, Bremen, Takamatsu, Canberra, Pinerolo, Sennigalia, Cincinnati, and others. Professor Emeritus of Israel Academy of Music, Tel Aviv University. Graduate of Gnessin Music Institute, Moscow; studied with Heinrich Neuhaus and Maria Yudina, with whom he recorded works by Bartok and Stravinsky for two pianos. Has given recitals throughout Europe and USA. As a member of Vidom Trio, recorded the entire trio, violin-piano, and cello-piano works by Brahms as well as the composer's sonatas for piano. Has taught master classes at Juilliard and Manhattan Schools in New York, University of Maryland, Gnessin Institute in Moscow, Karlsruhe Hochschule in Germany and others. While on a sabbatical from Tel-Aviv Music Academy, served as Pro-Rector of Music Department at the Maimonides State Classical Academy in Moscow. His transcription for a chamber group of the Shostakovich Fifteenth Symphony was published by Sikorski and recorded with Gidon Kremer for DGG. Professor of Piano, Seoul National University College of Music. Master-classes in Japan, Korea, South Africa, Israel, USA. 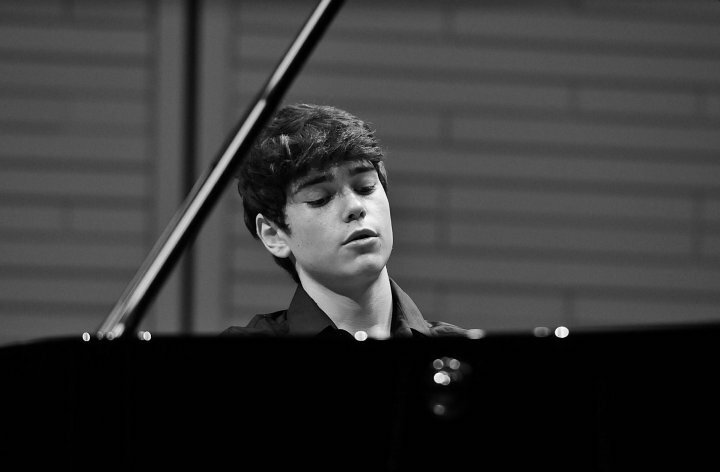 Prizewinner in numerous international competitions, including Bronze medal at the 10th Van Cliburn Competition in Fort Worth. Performed with such conductors as Sergiu Commissiona, James Conlon, James De Priest, David Lockington, Leon Botstein, Emmanuel Krivine, Michele Carulli, among others. Was heard in recital throughout USA, Europe, Far East, South Africa, and Israel. Among festivals he took part in: the Ruhr, Epinal, Ravinia, Gilmore, Fontana, Tokyo. Was heard in chamber music with Anne Akiko Meyers, Yuri Gandelsman, Guy Braunstein, Dylana Jenson, Philippe Quindt, and others. Started his piano studies with Hadassah Ben Haim; later worked with Arie Vardi at Tel Aviv University Academy of Music. Professor of Piano at University of Music, Basel, and Hochschule für Music und Tanz Köln. Has performed as soloist throughout Europe, in the USA, Canada, Russia, Central America, Japan and Korea, including appearances with Munich Philharmonic, Moscow Philharmonic, “Filarmonica della Scala”, Scottish Chamber Orchestra, Prague Philharmonic, “Orchestre de la Suisse Romande”, “Norddeutsche Rundfunk” Symphony Orchestra, “Philharmonia Hungarica”, and most of the major Spanish orchestras.Winner of numerous international competitions: Dino Ciani in Milan, Pilar Bayona in Zaragoza, Fondation Chimay in Belgium, was finalist in Santander, Spain. Among his teachers: Joaquín Soriano, Vitalij Margulis, Ferenc Rados, Leon Fleisher, Dmitri Bashkirov. He is also an accomplished viola player. Chair of the Piano Division at Shenandoah University in Virginia; Professor of Piano at the Glenn Gould School, the Royal Conservatory of Music in Toronto; International Visiting Artist at the Royal Irish Academy of Music and Visiting Professor at Showa University in Japan, he is artistic director and jury chairman of the Dublin International Piano Competition. One of today’s most sought after performers, teachers and contest adjudicators. Has given recitals in world’s famous halls, such as New York’s Lincoln Center, the Kennedy Center in Washington, the Wigmore Hall in London, Musikverein in Vienna, the Dvorak Hall in Prague, the Bunka Kaikan in Tokyo. Has appeared with leading orchestras on the five continents. Collaborated in chamber music with the Cleveland, Tokyo, Vanburgh, Vermeer, Takacs, and Ying string quartets as well as with singers and instrumentalists. Has conducted acclaimed master-classes throughout the world. First-prize winner in the Beethoven piano competition, Vienna, he studied in his native Dublin, then in Vienna with Dieter Weber. Made a special study of Beethoven with Wilhelm Kempff. Professor of Piano (for 34 years), Texas Christian University, director, Piano Texas International Academy and Festival. Performed extensively in Australia, Brazil, Canada, China, Columbia, England, Germany, Hungary, Holland, Japan, Korea, New Zealand, Romania, USA. The first performing musician ever to receive the coveted Leverhulme Fellowship in Britain. Teaches master-classes and adjudicates piano competitions worldwide. Records for CALA Records. Studied with Alexander Sverjensky at the Sidney Conservatorium, Lajos Hernádi at the Liszt Academy in Budapest, and György Sebök at Indiana University, where earned his doctoral degree. Chair, piano faculty, the Buchmann-Mehta School of Music, Tel Aviv University. Formerly dean, performing arts faculty, and piano department chair, Jerusalem Academy of Music and Dance. Graduated from Givatayim Conservatory, Rubin Music Academy at Tel-Aviv University, and Indiana University (Doctor of Musical Arts degree). Studied with Hanna Shalgi, Arie Vardi, Menahem Pressler, Leonard Hokanson, and Michel Block. Prizewinner, Casadesus competition in Cleveland and contests in Vienna, Sydney and Pretoria. Has performed with Israel’s leading orchestras, including Israel Philharmonic, under Zubin Mehta, David Robertson, Urs Schneider, Mendi Rodan, Noam Sheriff, David Shallon, and others. Concertized in Austria, Germany, France, England, Spain, Italy, Russia, Georgia, USA, South Africa, Australia, and Japan. Edited, presented, and performed in concert series, featuring collected sonatas by Beethoven, concertos by Mozart, piano works by Chopin, Brahms, Schumann and other composers. Professor of Piano, Rotterdam Conservatory; professor, Mozarteum in Salzburg; visiting professor, Royal Northern College of Music, Manchester. Regular master classes at Juilliard, Manhattan Schools, and Mannes College in New York, Moscow and St. Petersburg Conservatories, Toho University in Tokyo, München, Karlsruhe and Hamburg Schools, in Sydney, Melbourne, Seoul, Osaka, Bangkok, Indiana, Baltimore. His pupils won over 100 international competition prizes. His voluminous discography is under EMI His Master's Voice, BASF Harmonia Mundi, BMG-RCA Victor, Pavane, and EMS labels. Currently engaged in recording the complete Beethoven piano sonatas. Extensive concert appearances throughout Europe, twenty tours of Japan, eight of Australia, performances in USA and Mexico. Has collaborated with such conductors as Sir Yehudi Menuhin, Leopold Hager, Alberto Lysy, Vladimir Kim, Lee Dong-Ho, Ferdinand Terbi, among many others. Adjudicated Sydney, Pretoria, Cincinnati, Warsaw, Turin, Paris, Tbilisi competitions. Studied with Claudio Arrau, Eduardo del Pueyo, and György Cziffra. Professor of Piano at London Royal College of Music, Fellow of the Northern College of Music, recognised internationally as one of Britain’s leading pianists and teachers. Many of her top-prize winning students are well known on the international concert circuit. She has performed with many of the great orchestras of the world under leading conductors and with Europe’s finest chamber-musicians. At the age of 21, was top-prize winner in the Busoni International Piano Competition and the same year shared the Piano Prize of the Harriet Cohen International Music Awards with Vladimir Ashkenazy. A protégé of the eminent Greek pianist Gina Bachauer and pupil of Ilona Kabos, she is much in demand as a jury member of many major international piano competitions. Norma Fisher is the Artistic Director of London Master Classes, whose acclaimed courses attract major international talent to work intensively with top performers/teachers in London. Professor of Piano at University of Missouri in Kansas City, USA. Internationally celebrated Israeli representative of today's younger pianist generation. Has performed with the Philadelphia, San Francisco, Chicago Dallas, Saint Louis, Houston, Baltimore and Vancouver Symphonies, Los-Angeles, London and Israel Philharmonics and Radio France orchestra under Zubin Mehta, Herbert Blomstedt, Raphael Fruhbeck de Burgos, Vladimir Jurowski, Peter Oundjian, Klaus Peter Flor, and Yoel Levi. Recitals at New York's Metropolitan Museum of Art, Town Hall as well as the 92 street "Y", the Kennedy Center, Phillips Collection and Strathmore Hall in Washington, DC, the Dame Myra Hess series in Chicago, as well as in London (Purcell room), Moscow (Kremlin), Tel Aviv (Museum) and Jerusalem (Symphony Hall). Also performed at the Gilmore, Santa Fe, Marlboro, Ravinia, Verbier and Ruhr Festivals. Studied with Victor Derevianko and Arie Vardi in Israel and later with Leon Fleisher in the US. Recorded for Naxos Concerti by Mozart, Mendelssohn, Trios by Dvorak with his Tempest Trio and a solo CD of Scarlatti sonatas. Professor of Piano, Head of the piano department at the Krakow Music Academy. Among the venues of his performances: the Brahms-Saal and the Beethoven-Saal in Vienna, the Wigmore Hall in London, the Norsk Opera in Oslo, the Izumi Hall in Osaka, the National Theater in Brasilia, Grand Theatre Ningbo, Philharmonic Halls in Sofia and Kosice. Participated in numerous festivals, including the Bydgoszcz Music Festival, Music in Old Krakow, International Days of Krakow Composers, Encuentro de Musica International de La Serena (Chile), Leipziger Chopin Tage, Sofia Music Weeks (Bulgaria), Sollertinski Festival in Vitebsk (Belarus). Has made numerous recordings for Polish Radio and Television, osterreichische Rundfunk und Fernsehen, Radio Suisse Romande, and several CD’s ( Szymanowski, Tansman, Ginastera, Liszt, and Chopin). Has taught master courses in Brazil, Chile, Italy, Israel, Japan, Germany, Portugal and Spain. Graduated from the piano class of Tadeusz mudziski at the Academy of Music in Krakow; continued in the master class of Paul Badura Skoda at the Hochschule für Musik in Vienna. Also worked with A. Jenner, V. Perlemuter, G. Agosti, and T. Vasary. Head, Keyboard Faculty, the Jerusalem Academy of Music and Dance. Member, with Ro’i Shiloah and Ariel Tushinsky, of the internationally acclaimed Jerusalem Trio. Has been heard with the Israel Philharmonic, the Jerusalem Symphony, National Orchestra of RAI, Turin, Calgary Philharmonic, Santiago de Chile Philharmonic, the Camerata Virtuosi of New York, and other orchestras. Has given recitals and participated in chamber-music concerts in Israel, Europe, North and South America, Australia, and South Africa. Among his professional awards: the Leonard Bernstein Fellowship at Tanglewood, Italian Government Award for the Arts, and special fellowship from Banff Center, Canada. Taught master classes at the F. Liszt Academy in Budapest, the Jerusalem Music Center, and Sidney Conservatory. Studied with Benjamin Oren and Pnina Salzman in Israel and with Murray Perahia in London. Professor of piano, the Gnessin Academy of Music, Moscow, and the Special Gnessin School of Music (for more than 40 years); one of the leading piano pedagogues in Russia today. A student of Prof. Theodor Gutman (himself a student of Heinrich Neuhaus), she produced an array of internationally acclaimed piano virtuosos: Alexander Kobrin (winner, the Van Cliburn competition), Konstantin Shamray (winner, the Sydney competition), Konstantin Lifshitz, Katia Skanavi, Mikhail Mordvinov, Ivan Rudin, Elena Rozanova, Daniil Trifonov, and others. In high demand as a master-class teacher in Russia and abroad – Kuhmo (Finland), Colmar (France), Portogruaro and Asolo (Italy) festivals as well as conservatories in Holland, Ireland, USA, Austria, and Japan. Has served on juries of numerous international competitions. Professor at the Tchaikovsky State Conservatory and Central Music School, Moscow. Prizewinner, Van Cliburn International Piano Competition, 1978. Performs extensively in Russia and abroad - as soloist with orchestras, recitalist and in chamber ensembles. His professional mastery, pianistic skills and sense of ensemble have been befittingly appraised by such well-known conductors as V. Gergiev V. Jordaniya, D. Kakhidze, F. Mansurov. Recorded several discs. Taught master classes in France, Brazil, Japan, Taiwan, Finland, Israel and Portugal. Among his pupils are over 30 laureates of different international and national competitions. He repeatedly was jury member and chairman of various international and national competitions. He cooperates with publishing house "Muzika” as an editor. Born in Erevan; graduated from Moscow Tchaikovsky Conservatory, where studied with Bella Davidovich; postgraduate work at the Gnessin Institute under Alexander Yokheles. Pianist and conductor Yoni Farhi has served as assistant to the music director of Haifa Symphony Orchestra (2006-2013). Faculty member, the Levinsky College master degree program and Rimon School of Jazz and contemporary music (Condcuting and composition department). Winner of the 2006 Gina Bachauer Award of the America-Israel Cultural Foundation; has performed as piano soloist and conductor with Haifa Symphony, Jerusalem Camerata Orchestra, Israel Chamber Orchestra, Israel Netanya Kibbutz Orchestra, Ra'anana Symphonette, Tel-Aviv Soloists' Ensemble, Israel sinfonietta beer-sheva . Appeared in Britain, Germany, Austria, Poland and Belgium. Studied piano with Hadassa Biribis, Emanuel Krasovsky and Pnina Salzman, composition with Sergiu Natra. Yoni studied conducting with Noam Sheriff and between 2011-2013 under the guidance of Daniel Barenboim at Berlin Stattsoper. Master of Music degree from the Buchmann-Mehta School of Music, Tel-Aviv University. Music Producer to Tel Hai International Piano Master Classes since 2002. The Piano Duo of Tami Kanazawa and Yuval Admony has been awarded The First Prize in five international competitions: 2008 Oslo Prize in Grieg Competition, 2005 Menuhin Gold Prize in Osaka International Competition, 2002 Ibla Grand Prize in Italy, 2001 Rome Prize, and the 2000 Tokyo Duo Competition. They taught piano-duo master classes in The Norwegian Academy of Music, Korean National University of Arts, Pacific Rim Festival in Canada, for Japan National Piano Teachers Association, and from October 2011 are teaching Piano Duos at The Buchmann-Mehta School of Music, Tel Aviv University. The duo appeared in over 20 countries in prestigious halls, including Carnegie Hall, Argentina Theatre in Rome, Tokyo Metropolitan Festival Hall, Warsaw National Radio, and others. International festivals include The Budapest Spring Festival, Klavierduo Festival in Germany, Odessa Dialogues in Ukraine, Asian Music Festival, Oslo Grieg Festival, Felicja Blumental, Upper Galilee, and Israel Festival here. Broadcasts by BBC in London, CBC in Canada, Tokyo FM, NHK in Japan, BNR in Bulgaria, Budapest National Radio, Radio New Zealand, Israel's "Voice of Music". Performed with Israel's leading orchestras. Their Symphonic Poems by Liszt on Naxos label was acclaimed in Fanfare and International Piano magazines. Duo's other releases, include Rhapsodies for Two Pianos, issued by Romeo Records. Jonathan Zak was born in Israel and has graduated from the Juilliard School of Music, New-York. He has appeared as soloist with all of Israel major orchestras and has performed extensively in Israel, Europe, the USA and South America where he gave solo recitals and also appeared as instrumental and vocal accompanist. In 1969 he was one of the founders of the world renowned "Yuval" trio. The Trio has appeared all over the world and has recorded for "Deutsche Gramophone", "CBS Masterworks" and others, including 2 CD's for "Romeo Records". Mr. Zak has also recorded often for the Israel radio and for various radio stations in Europe. His recordings with Irena Friedland as a Piano-Duo team for "Romeo Records" received rave reviews in some of the most prestigious music periodicals in the U.S. and Europe. He has recorded with singer Sivan Rotem for "Romeo" Spanish music and for "Naxos" songs by Meyerbeer, and with Ayelet Amotz-Avramaon songs by Brahms, Mahler and Berg, also for "Romeo". His recording with Sharon Rostorf-Zamir for "Romeo" of Schumann Lieder was chosen by "Fanfare" as one of the year's five best recordings. Mr. Zak served on the jury of several international music competitions such as the Arthur Rubinstein international Piano Competition (2008),The ARD chamber music competition in Munich (twice), the Shubert and 20th Century Music competition in Graz, the International Harp competition in Israel, etc. He is currently full professor (Emeritus) at the Buchman-Mehta Music School of the Tel-Aviv University, where he teaches piano, chamber music and vocal accompaniment. Mr. Zak received in 2013 the prize for best musical performance from the board of trustees of the culture ministry in Israel. Her performance of the complete works of Bach for unaccompanied bowed instruments (the cello suites, on viola) in New York in March 2018 hailed as a "colossal achievement" by New York Concert Review, Vera Vaidman is among Israel's foremost violinists, violists and chamber-music players. Has performed as a soloist with all Israel's orchestras, conducted by Zubin Mehta, Gerard Schwarz, Andre Kostelanetz, Rudolf Barshai, Sidney Harth, Lucas Foss and others. Participated in the Marlboro Chamber Music Festival, where she performed and recorded with Rudolf Serkin, Andras Schiff, Philipp Naegele and Felix Galimir among others; the Esbjerg Chamber Music Festival in Denmark; the Gotland Festival in Sweden; Kfar Blum Festival in Israel. Served as leader and soloist of the conductorless Ramat Hasharon Camerata Women's String Orchestra as well as the first violinist of the Gertler String Quartet, Tel Aviv. A graduate of Moscow's Tchaikovsky Conservatory, where studied with Boris Belenky and David Oistrakh. Principal cellist, Orchestra Filarmonica Arturo Toscanini di Parma, Italy, with which performed as soloist on numerous occasions. Graduate, "George Enescu” music high school in Bucharest and the Music Academy, Tel Aviv University, where studied with Uzi Wiesel and Emanuel Gruber. Further studies with Radu Aldulescu at the Yehudi Menuhin Academy in Gstaad, Switzerland. Master classes with Janos Starker, Aldo Parisot, and David Geringas. A founding member – with Mihaela Costea and Victor Derevianko – of the Renaissance Trio, she took part in chamber -music concerts in Italy, France, USA, Slovakia, Japan, and Russia.